It comes to something when The Daily Telegraph, with its famously aspirational readership, returns from the Dubai Air Show with the headline “First Class is getting increasingly ridiculous”. We think the paper is being tongue in cheek. As the actor Sid James once said on the subject of money: “If you’ve got it, spend it; if you haven’t got it, make it.” We see nothing wrong in those with it spending it on travelling First Class, and clearly nor do the airlines as they indulge in their latest game of “luxury one-upmanship” (to quote the Telegraph again). 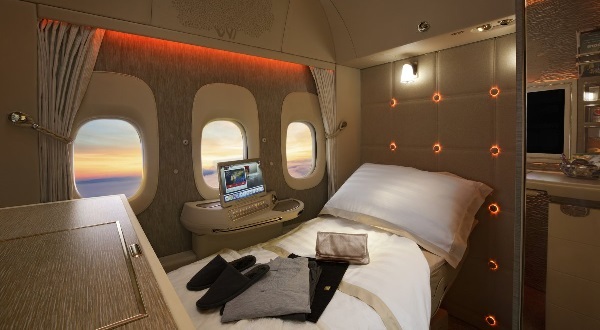 The subject that sparked the latest debate was Emirates’ unveiling on the eve of the Dubai gathering of its new interiors for the Boeing B777 fleet, including fully-enclosed First Class private suites that include the industry’s first “virtual windows”. As summarised in BTN last week, the suites have floor-to-ceiling sliding doors in a 1x1x1 configuration, with those in the middle aisle equipped with the virtual windows to ensure all First Class passengers have a view. The windows project the view from outside the aircraft using real-time camera technology. In the other suites, binoculars are available for passengers who want to explore the sky outside. Royal Caribbean Cruise Lines has “virtual windows” for some of its inside cabins on the largest ships. They work very well. But viewing the sky rather than the sea is something else! How the First Class private suites compares with Etihad’s “Residence” remains to be seen. Singapore Airlines is also introducing double beds on its A380s. Other airlines are working various top-end upgrades, although the always innovative Qatar is using Business Class for its new double beds. British Airways' First Class has always had a good reputation for service. Alex Cruz said last week that it was considering “potential First Class arrangements” and an “increase in square footage”. As for price, it’s clearly an example of the old saying “If you have to ask, you can’t afford it." For the record, an Emirates First Class ticket from London to Dubai, a 6hr 45min journey, was being quoted online yesterday at “from” £4,129. London however may have to wait for the new B777 experience – the first aircraft equipped with the new interiors, which also encompass upgrades in the Business Class and Economy cabins, enters service on 1 December with flights to Brussels and Geneva. Why these two destinations? Make up your own mind! Heathrow is at least 6hr, long enough to really enjoy the service. It might make more sense.